Friday 24th of June at 5 pm Margherita Moscardini will present Project for the Ancient Bath at the Center for Contemporary Art Plovdiv, as the result of the research period she spent there as part of the exchange program etween Italy and Bulgaria organized by Nosadella.due. 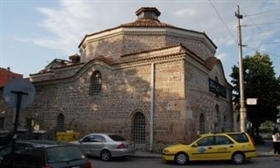 The project has its roots in the same place where it is hosted, a place of reference and lived by the artist in residency: the Ancient Bath, with its original hamam structure, nowadays is the base of Plovdiv Contemporary Art Center Art Today. In this building the artist could read the history of the city, not only as the civilization but also as time going across it. As the water of a river carries debris along its course – sometimes leaving them and some other time depositing them – this town apparently doesn’t have a conformity and embellishment planning strategy, but is openly subjected to the flow and the stratification of events and their necessities. The Ancient Bath plan is superimposed to the Bulgaria hydrography, where rivers wildly outline the territory, constantly changing it, ignoring political boundaries and without tracing definitive dividing lines. The empty baths drops – almost like an upside-down pedestal – are considered a big table of study, of information collection and cartographical planning, where information is catalogued into drawers and then unnoticeably lost because of its impossibility to be kept. This represents some local rivers water which floods the environment again drop by drop, challenging its current role and any effort to define a destination. Margherita Moscartini’s residency is part of the exchange program organized these last two years between Nosadella.due and Bulgaria, as part of PASS – Produce Art (as) Social Strategy, created by Giusy Checola in collaboration with Elisa Del Prete. The project is dedicated to Italy exploration as a Mediterranean country and to the dialog with those Eastern European countries which consider Italy as the “promised” or “transit” land, in order to investigate transformation processes through artists practice and point of view. Margherita Moscardini attended the Advanced Course in Visual Arts, Fondazione Ratti, Como, held by Yona Friedman and the workshop by Peter Friedl in Fondazione Spinola Banna per l’arte, Torino. In 2010 she was invited to take part of the residency program of CCA Andratx, Mallorca, Spain. In 2007 she won the first edition of Premio Pinacoteca Giovanni e Marella Agnelli, building a permanent intervention inside the Vallette prison, in Turin. Her main solo shows: Una Stanza/Fuori Luogo, galleria SpazioA, Pistoia, IT, Studio per un'erosione, Fondazione LaQuadriennale, Roma, IT. Her main group shows: Mastermind, neon>campobase, Bologna, IT, Ada, Musei civici of Imola, Bologna IT, Public Improvisation, careof, fabbrica del vapore, Milano, IT, In Full Bloom, Galleria Raffaella Cortese, Kaleidoscope project space, Milano, IT; Collecciò Art Foundation Mallorca, Andratx, Mallorca, SP; EmergingTalents 2011, CCCStrozzina, Palazzo Strozzi, Firenze, IT; Premio Ariane de Rothschild, Palazzo Reale, Milano, IT.